You can remove attachments from messages you're composing as well as from messages you've received. You can only remove attachments from a single message at a time. Open the email that contains the attachment you want to delete. In the Attached box, right-click the attachment, and click Remove or select the file in the Attached box and then press the delete key on your keyboard. Note: This method deletes only one attachment at a time. To delete multiple attachments at once, press and hold the Shift key on your keyboard. Click the first and last attachments in the series, and press the Delete key to delete them all. If you want to remove an attachment from an email message you've received from someone else or a message you've sent, you can do this one message at a time. You cannot remove attachments from multiple messages at once. Open the email message in the reading pane or double-click the message to open it in a new window. Select the drop-down arrow next to the attachment name and then select Remove attachment. You can also select Save to OneDrive or Save As first to transfer the attachment to OneDrive or to your computer, then select Remove attachment. 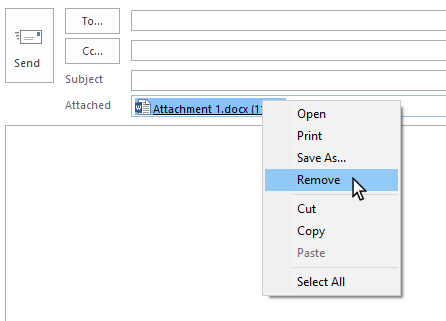 If the email message contains multiple attachments, select the first attachment, press and hold the Shift key on your keyboard, then select the last attachment. Select Remove attachment to remove all selected attachments. Close the message and save changes. To remove an attachment displayed in the message body, double-click the message to open it in a new window. From the Move group in the ribbon, select Actions > Edit message. Click to select the attachment in the message body and then press the Delete key on the keyboard.